1. 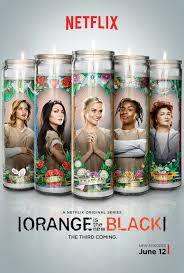 I binge-watched my way through season 3 of Orange is the New Black this past month. There was a different vibe to this season than the last, with no big baddie tying many of the inmates together. Instead, a variety of smaller storylines shuffled the characters forward, seemingly with an eye toward how things would blossom in the next season instead. However, we did see most characters' experiences with the themes of parenthood and faith: many flashbacks tended to focus on these, and several storylines featured them. Perhaps the one overarching story featuring every character was a private company taking control of the prison, which brought significant changes to the system and way of life for everyone, usually not for the better. And the very last scene is the adding of beds and the ushering of busloads more inmates into the building, signaling a drastic shift for the population. It was a transitional season, during which we saw some of the better and more intriguing backstories of the series so far, setting things up for the next. 2. I recently finished Sabbath as Resistance by Walter Brueggemann, where he analyzes all the different dimensions of keeping the Sabbath, and how it is in many ways a protest against a culture that demands constant production and consumption. In classic Brueggemann style, he weaves a thread from the commandment in Exodus 20 all through the rest of scripture to show how Sabbath is an act of defiance against societal pressures that ultimately dehumanize and commodify. After hearing great things about it from so many, I'm glad I finally read it myself. It was also very timely, as I've been having issues with keeping Sabbath lately. 3. I also read and enjoyed If These Walls Could Talk: Detroit Tigers by Mario Impemba and Mike Isenberg. The bulk of the story is by Impemba, a broadcaster for FOX Sports Detroit, who shares his experiences as an announcer and journalist not just for the Tigers, but also from his previous stops with the Angels and in the minor leagues. The book covers everything through the 2013 season, and he shares what things have been like around not just Detroit but MLB in general over the years that he's worked in the field. The result is a lot of interesting and funny stories of interactions with players and managers, times on the road, and what it's like to do his job. These sorts of books are great not just for fans of a particular club, but for fans of the sport in general. 4. The awesomely terrible experience that was Sharknado 3 happened the other week, where Ian Ziering, Tara Reid, and a bunch of other recognizable faces battle sharks...in tornadoes. I've come to look forward to this self-aware silliness every July, complete with social media running commentary. This year, however, the reaction online seemed more subdued, at least in my feed. That, and I think the franchise is trying harder and harder to top itself. This time there were sharks in a space shuttle. No, seriously. Still alive and everything. Really, I'm serious. But that's part of the dumb fun! Coffeewife remains unconvinced. Anyway, they've already announced that there will be a fourth installment, so that's something to look forward to. 5. Alchemy, the first original album by Meytal, released this month. Meytal is the band started by drummer Meytal Cohen, whom I discovered years ago during a random Youtube search. Her story is pretty incredible: born in Israel, served for 2 years in the IDF, moved to California to attend school, and started posting videos of herself drumming along to her favorite metal songs. People started paying attention, and she eventually ran a crowdfunding campaign to produce her first original album. She's incredibly gifted and I'm excited for her that she's reached this point. The songs are no-apologies metal, with the drumming especially tight (of course). Here's a song from the album, "Shadow in Disguise:"